When I care about anything, I care deeply. The more my class discussion dragged on, the more intense our debate became. The room was divided: some people supported us, while others did not understand us. I sat back in my seat, biting my tongue as I listened to my classmate rebuke an organization that’s so meaningful to me and my time at UChicago. I glanced quickly at the other sorority sisters in the room, hoping to find some sort of solidarity. It’s easy for an outsider to not recognize the numerous benefits of Greek life, but hearing that our involvement on campus is essentially worthless was a hard pill to swallow. This past year, especially on our campus, Greek life has been drowning in criticism, struggling to resurface with the respect it deserves. The numerous sexual assault allegations that brought frats under fire have dragged sororities’ reputations down too. Our student body cares only about the negative drama. What makes the news? Scandal and the fiery drama that circulates on Overheard at UChicago and Yik Yak. 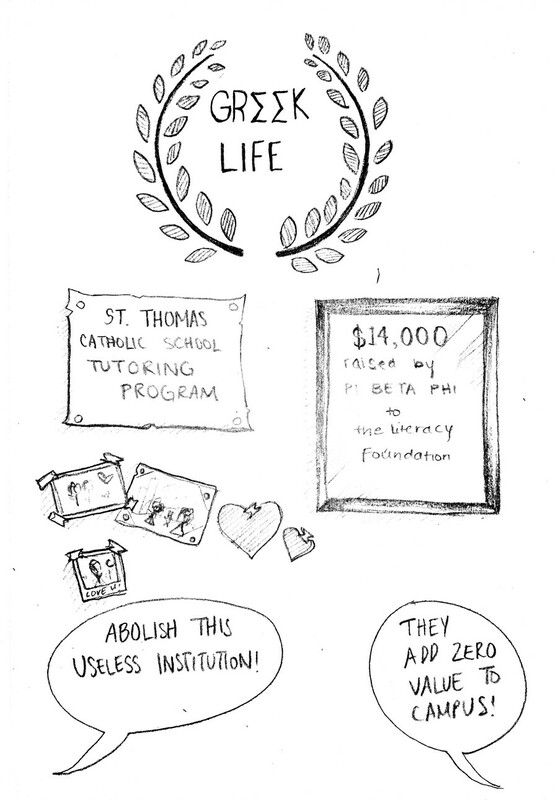 Nobody wants to hear that Pi Beta Phi, my sorority, sends girls every week to St. Thomas Catholic School to tutor children. Does no one care that we donated $14,000 to the Pi Beta Phi’s literacy foundation to promote children’s literacy? After spending fall quarter abroad, I spent my first few weeks of winter quarter consumed by social anxiety. Reacclimating to on-campus life was daunting, but my sisters provided me with the sort of social safety net that helped me find my place again. I was invited to sisterhoods (often off-campus events to the Lyric Opera, movies, or restaurants with only sisters), ate too much pizza at formal, was a co-emcee at Arrowfest, watched movies and ate popcorn with my grand-big, and studied in a Reg room after chapter with 10 or more sisters. My sorority has built me up. My sisters have given me an insane amount of support, assuring me that they’re there for me whether I’m in Hyde Park, Chicago or Hyde Park, London. Sororities and fraternities are by nature inclusive, not exclusive. There aren’t any prerequisites. At the beginning of each academic school year, each sorority encourages all girls to consider going Greek; if you want to explore, all sororities are open to you, and both the girls and the sororities work together to determine which one best aligns with their interests. Rushing is just like interviewing with any university—you determine which is the best fit for you. Like being a student at UChicago, Greek life is another organization that allows for connection and networking. The differences between the role of a non-Greek affiliated student and the role of a sorority sister are very few. In both situations, we work to educate ourselves and one another, make long lasting friendships with our peers and our superiors, and find leadership positions. And now more than ever, sororities and fraternities are working closely to address the atrocities of sexual assault and promote sexual assault awareness, education, and prevention. We are responsive. Greek life is dynamic and empowering. Arrowfest, IF Sing, and Anchor Slam are all Greek-affiliated charity events that want to involve the entire campus. Bar Night and its culture are a campus-wide phenomenon. Yet when the negative attention which surrounds Greek life overshadows the positive aspects, campus slowly rejects us. But these organizations are important to us. We put a lot of time, dedication, and love into them. You might not agree that Greek life is well-intentioned or that it brings anything positive to campus, but there’s a difference between disagreeing and devaluing. Don’t ignore the good that Greek life has done to make your argument easier. Brooke White is a second-year in the College majoring in public policy.